When should you hire a manager? "Be smart. Ask questions. 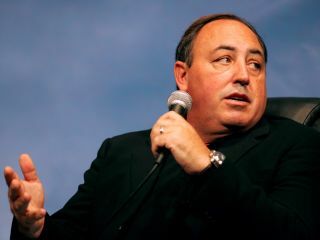 This is serious"
"A manager has to have vision, passion"
Bon Jovi, Motley Crue, The Scorpions, KISS - during his nearly 30 years in the music business, Doc McGhee has been the guiding force behind them all. The Los Angeles-based manager runs McGhee Entertainment (he also has an office in Nashville), where he currently oversees a roster of twenty acts. "It's a very weird thing that I do," McGhee admits. "There's no degree in music management, but there is something of a science to it. That science isn't written in stone; there's many variables to it. But after you work at it for a lot of years, you know what usually works." MusicRadar sat down with McGhee to get his thoughts on managing successful musicians. In particular, we wanted to know, at what point should an artist hire a manager? And what should one look for in representation? The cordial and colorful McGhee was happy to hold forth. When does a musician or band need a manager? "When they start getting interest. Whether they're developing a strong local following or record companies are contacting them - if something real is happening, that's when a manager can help. Sometimes bands sign with management too soon, expecting us to wave a magic wand and turn them into superstars. Doesn't work that way. We're talkin' the big leagues. You don't just write five songs and call up McGhee Entertainment. Develop your songwriting, create excitement, work on your act. Be ready for us so we're ready for you." What questions should an act should ask a manager? "I've managed bands that have traveled to 52 countries and sold over 20 million albums each - I've had a bunch of them. If you want to be an indie band, there's a lot of managers that can deliver that kind of career. But if you want to be a superstar, there's only a handful of people that can get you there. A manager has to have vision, connections, passion. It's like being a football coach - you have to be able to put a workable game plan together." What do you look for when considering a new artist? "I look for a star! [laughs] But I also look for somebody who is driven, has passion, commitment; somebody who understands that show biz is a lot of hard, punishing work; who is willing to play every dive and toilet until it's their time to pop. I ask each potential client, 'Are you willing to do whatever it takes to make it?' If they can't say 'yes,' then I'm not interested." What percentage does a manager typically take? "As much as possible! [laughs] I'm a 20 percent manager, but I've done deals where I take 15. Believe me, there's managers who take 15 percent who should give 15 percent back! [laughs] There's managers and there's damagers. A manager is worth every penny. A damager isn't worth a damn." In these changing times of the music business, should a young band be concerned with '360' deals? "Yes. But again, you have to know who you're signing to. If you sign a 360 deal with a strategic partner and they break you and you become a star, and they introduce you to TV and radio and make your merchandising mean something, then you've made a great decision. But if you sign a 360 deal with somebody who can't deliver in any of those areas, then it's worthless." Is working with acts different now than it was back in the day? "From day one, my job has been about finding the cheese. And the way I look at it is, they've just moved the cheese. [laughs] Everybody always says to me, 'The record business is over.' OK, so it's over. Big deal. There's still avenues of income that have opened. Downloads, ringtones, commercial licenses - there's a lot of different ways to skin a cat. A good manager is going to figure that out." What do you think about bands like Radiohead who distribute their music for free or pay-what-you-want prices? "First off, Radiohead didn't give anything away. The average price they got for In Rainbows was four pounds or eight bucks. The only question is, how many did they actually sell? That's the part that nobody knows. "I have no problem with giving something away. A new song, a T-shirt, some live tracks - what's wrong with that? And KISS have no problem with that either, despite some of the things Gene has said. You give somebody something for free, it's going to help bring them in the door. But you don't give them the keys to the whole farm. That's just stupid." "There's managers and there's damagers. A manager is worth every penny." How involved in the artistic process do you get with your acts? "Very. I can't write the songs for the artists, but I can manage the quality of what they're doing in the studio - by making sure they have the best material before they get to the studio. Sometimes I'm the bad guy and tell a band, 'It's not there, keep writing' - it's hard. It's never about my personal taste; it's about what I think will sell. "Another thing I do is I try get people involved. Marketing people, promo, publicity, sales - I play them demos, I play them roughs, I get their opinions. Also, it helps once the record is done because then those people, those gatekeepers, they feel an ownership of the record, and they're pumped to bring it home." "Our artists are family - and we have a very dysfunctional family. [laughs] I'm very involved with their lives. I try not to babysit them, but if they need me, I'm there. Listen, it's not all about the money. I've made money. It's about teaching people to be good people, to work hard, to do great things. Some of them get it, some don't. A lot of artists have these crazy death wishes, or they think they're invincible. It's a part of being a star, unfortunately." Finally, what's the hardest part of working with Gene Simmons?